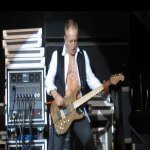 Def Leppard played a show in Uppsala, Sweden last night and the first fan videos have been posted online. Fans have uploaded footage from the show which took place at the Vaksala Torg (Square). Watch a video of 'Rocket' below as posted by XVIIDays.